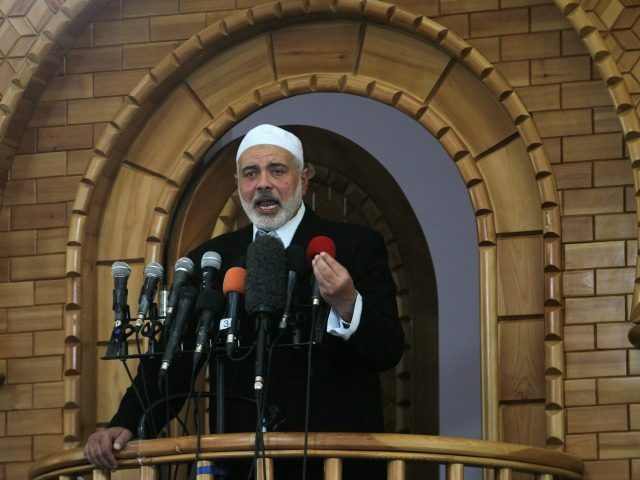 Ismail Haniyeh (pictured), former Prime Minister of the Hamas government, is “in no hurry” to return to the Gaza Strip for fear that the Islamic State’s Sinai offshoot will try to assassinate him, a senior Hamas operative told Breitbart Jerusalem. According to the Hamas official, Haniyeh’s return to Gaza has been postponed for the second time in the last several weeks as tensions between Hamas and IS in the coastal enclave reached a boiling point following a major Hamas crackdown on IS-affiliated jihadists. The source told Breitbart Jerusalem that Hamas received a concrete threat from Sinai-based Islamic State jihadists, who said they would assassinate Haniyeh should Hamas not accede to their demand to release their operatives and supporters arrested in recent months. Haniyeh, who has been residing in Qatar for the last few months while preparing to succeed Khaled Meshaal at the helm of the Islamist movement, was supposed to return to Gaza in late November, but his arrival was pushed back for fear of assassination. He was set to visit Egypt this week with fellow top Hamas official Mousa Abu Marzook and travel from there to the neighboring Gaza Strip, but the plan was called off once more due to threats from IS jihadists. Abu Marzook, deputy chief of the Hamas politburo, traveled to Egypt without Haniyeh to meet with senior intelligence officials and discuss further rapprochement between Hamas and Egypt after weeks of preliminary contacts, as well as ways to ease the burden of Israel’s blockade of Gaza. Abu Marzouk further added that his meetings with Egyptian government officials were devoted to the situation in Gaza as well as efforts to bring about a reconciliation between Hamas and the Fatah movement in the West Bank.